All Posts / Our Championships / Everest Canadian Seniors kicks off in Chilliwack, B.C. Everest Canadian Seniors kicks off in Chilliwack, B.C. 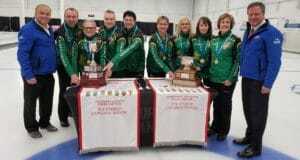 The experience of Saskatchewan’s Sherry Anderson and her team came into play with her two wins on the opening day of the 2019 Everest Senior Men’s and Women’s Curling Championships underway in Chilliwack, BC. Anderson, with a 9-2 win over Northwest Territories’ Sharon Cormier and a 7-3 over the Quebec’s Odette Trudel, was one of two women’s teams to notch two wins on the first day of the round robin at the championships taking place at the Chilliwack Curling Club. After three draws, Nova Scotia’s Nancy McConnery joins Anderson at the top of the leaderboard. McConnery started off with a commanding 9-4 win over Prince Edward Island’s Kim Alyward and followed that with an 11-2 win over New Brunswick’s Judy Ross. 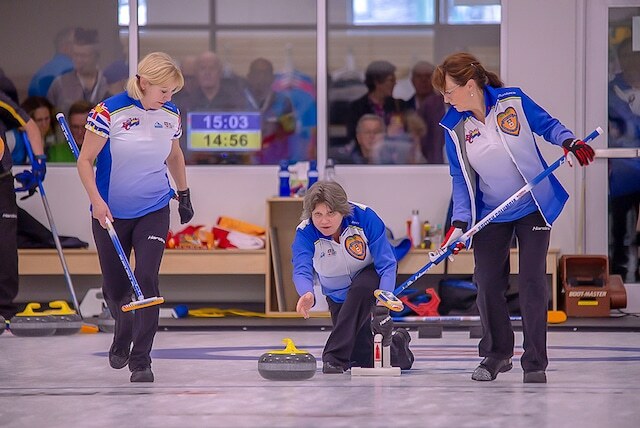 Alberta’s Glenys Bakker, Northern Ontario’s Kim Beaudry, Ontario’s Sherry Middaugh and Manitoba’s Terry Ursel all picked up wins to start out with 1-0 records after the first day of competition. In Men’s round robin action, and fresh off his recent Brier experience, Nunavut’s Peter Mackey led his team to a 5-4 victory over New Brunswick’s Wade Blanchard. Mackey then showed no “fear of the moose” to clinch a win over Northern Ontario’s Al Hacker 6-4, stealing the final end to take top spot on the men’s leaderboard with a 2-0 record to open the event. Quebec’s Francois Roberge, making his first appearance at the Canadian Seniors, started off strong, opening with a 9-3 win over Glen Hudy from Northwest Territories and then picking up a commanding 11-1 win over Prince Edward’s Island Phil Gorveatt. Saskatchewan’s Bruce Korte and Nova Scotia’s Brent MacDougall also picked up wins and join the leaders with 2-0 records after day one. British Columbia’s Wes Craig and Alberta’s Wade White finished Day 1 undefeated at 1-0. B.C.’s foursome opened with a 7-1 decision over New Brunswick’s Wade Blanchard, while Alberta opened with a 11-3 triumph over Glen Hudy from the Northwest Territories. Round robin action continues on Saturday with three draws (10:00 a.m., 2 p.m., 7:00 p.m., all times PT) in both Men’s and Women’s games, spread out over the brand-new eight-sheet Chilliwack Curling Club. Draw results for the 2019 Everest Canadian Seniors will be available at www.curling.ca. For event information, visit www.curling.ca/2019seniors. Selected games from the 2019 Everest Canadian Seniors will be streamed live by CBC Sports. You can watch at cbcsports.ca or via the CBC Sports app for iOS and Android.